British helicopter pilot Jennifer Murray became the first woman to successfully fly round the world in a helicopter 20 years ago, on 8 August 1997. She completed the feat in 97 days, flying with co-pilot Quentin Smith. Flying a small, single-piston helicopter, the Robinson R-44, she and he set off from England on 10 May 1997. They then flew east, travelling through 28 countries before arriving back in England on 8 August. Their route took them through Europe to Italy, then across the Middle East and India to Southeast Asia, up into Russia, across the Bering Strait to Alaska, down into California and across the USA before flying up Canada’s coast and back to England via Greenland, Iceland and the Faroe Islands. The feat earned her several world firsts –first woman, first grandmother, smallest helicopter and first British pair to circumnavigate the globe in a helicopter– as well as an FAI World Record. The FAI World Record is for Speed Around the World: Eastbound, in a single-piston engine helicopter, and was set at 22.44km/h. The helicopter could fly for up to six hours at a time before needing refuelled. She was 56 when she set out to become the first woman to circumnavigate the world in a helicopter. She had been flying for just three years and had 600 hours in the air. The aim of the round-the-world flight was to complete it in less than 100 days and raise $500,000 for charity. Murray’s 1997 achievement was just the first of several firsts that she achieved in the world of helicopters over the next decade. In 2000 she became the first woman to fly a helicopter solo around the world, and the first person to fly a helicopter solo around the world without auto-pilot. Three years later, in 2003, she became the first woman, together with co-pilot Colin Bodill, to fly a helicopter to the South Pole; two days later the pair narrowly survived a crash which saw them ditching in a white-out in Antarctica. 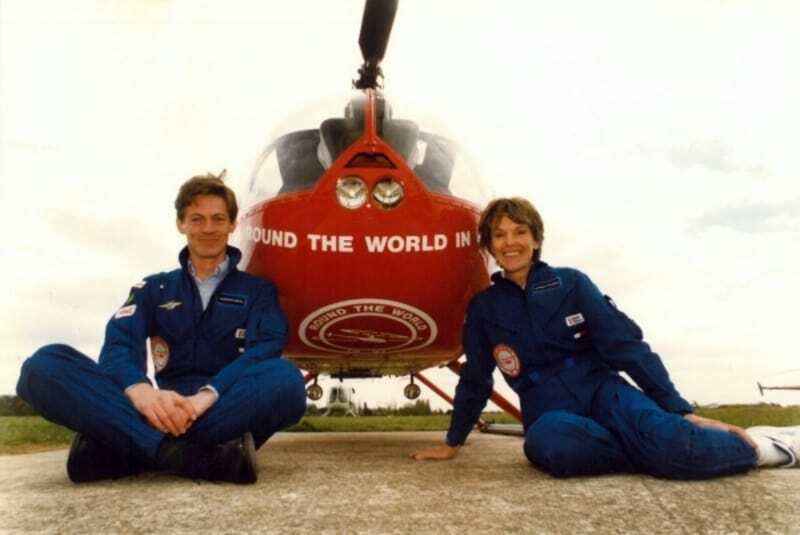 In 2006/7 she and Bodill returned to Antarctica on a journey that saw them become the first pilots to fly around the world in a helicopter via the South and North Poles. She published three books about her adventures: "Now Solo", about flying solo around the world; "Broken Journey", the story of her flight to the South Pole; and "Polar First", about her second flight around the Poles. Murray was born in Providence, Rhode Island, USA, but grew up in England. A textile designer by profession she spent many years living in Thailand and Hong Kong working in the textile businesses before helicopters “took over” her life at the age of 54. She lives in Somerset, England, and has three grown up children.